Last night we had grilled snow crab legs on the Char-Broil Big Red Infrared grill. It was the first time my younger son had crab legs. The older one had some last month at his fraternity ZBT at UNC Chapel Hill. He loved the crab legs and was stoked that we going to put some on the grill. 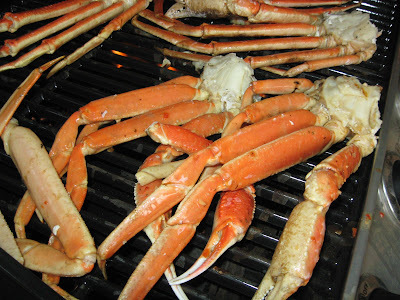 Crab legs are super easy to make on the grill. Just marinate in Italian dressing or brush on some olive oil right before grilling. Heat the grill to medium (300 to 350 degrees). Cook about five minutes on each side depending on the size. The end meat part will look white and still be soft. Shells will turn a little brighter in color and have some grill marks. Yep. That's simple enough. Just don't overcook the crab legs, or they will be rubbery. That's about the only way you can mess up grilled crab legs. Why haven't I done these before for the guys? Good question. And, mothers can tell you. When kids are little, they may go "yuck" about something that looks different. Also, you spend a lot of time cracking crab or deboning fish with little ones. Then, you're all messy and too tired to enjoy your own food. 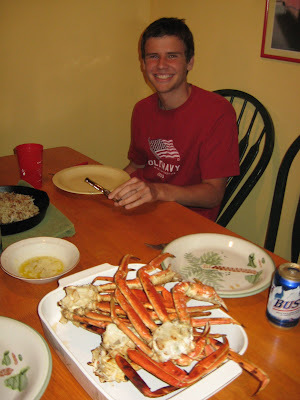 Here's my college kid carrying in the grilled crab legs. He's excited, because he has only had them boiled. He knows grilled food is the max, so he is all ready for this crab feast. See. Told ya. This kid can't wait to dig in. Just waiting for the rest of the crew to get on over to the table. The younger one is wondering about this food that is trapped inside hard shells. Actually, the shells are softer off the grill from my experience. Still, it can take a little work to get the king crab shells cracked. The kid is a sport, and he's working it hard as you can see. Oh yes! Crab crackers. While you don't have to use crab crackers especially with king crab legs, they are nice to have. My sister gave me a set of restaurant quality crab crackers when I lived on the eastern shore of Virginia and was cracking blue crab which really does take a lot of work. My sister worked at Blue Bay Seafood restaurant as a waitress in Cleveland, NC. They've closed that one but still have two Blue Bays in Salisbury, NC and a couple of other places I think. In any case, her boss let her order them way back then through the restaurant. So, I have nice crab crackers. 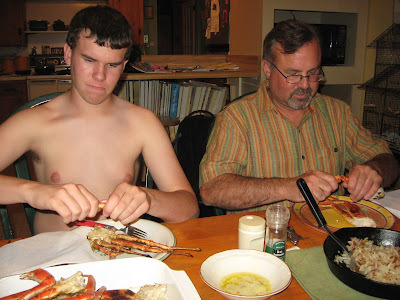 And, now both boys are grilled king crab fans. 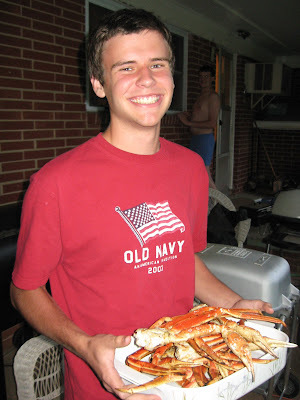 As you can see, my younger son was mighty glad to have a tool for getting to that crab meat. Actually it is indeed snow crab. You can tell by the long narrow pinchers. A handy tool form cutting King or Snow crab are kitchen shears!